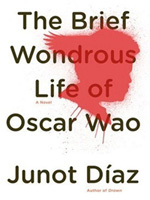 I was reading "The Brief Wondrous Life of Oscar Wao" by Junot Díaz, and it was extremely slow going since I need my laptop nearby the entire time, with Wikipedia, Google, and Google translate open. This was also annoying because it meant that I couldn't really read on the subway or elsewhere without an internet connection, unless I wanted to miss out on half of the story. So around page 40 I realized that other people probably are having similar issues (as evidenced by this chat transcript), and I might as well take notes while I'm going along. I give absolutely zero warranties as to its accuracy or thoroughness, you follow all links at your own risk, blah blah etc etc. Translations mostly taken from Google Translate ( http://translate.google.com/ ) Page numbers are for the paperback version. Hopefully it's easy to print these pages out and bring them with you, so you can read this (really quite good) book anywhere you want. If you can help improve this in any way, please drop me an email (in English) and I'd be happy to change it - this is just what I was able to cobble together. Huge thanks to everyone who has contributed so far!